Posted May 12, 2018 by Eds. Friedrich Engels, while informing a common friend about Marx’s death in March 1883, wrote “…mankind is shorter by a head, and the greatest head of our time at that”. Few would have agreed with Engels’ appraisal at that time. By the turn of the century though, the ideas of Karl Marx had started capturing the imagination of millions across the world. After the Russian revolution of 1917, Marxism emerged as one of the most influential political ideologies which shaped world events throughout the twentieth century. It not only inspired socialist revolutions in countries like China, Cuba and Vietnam but also influenced the national liberation movements against colonial rule in Asia, Africa and Latin America. Many of the key actors in India’s freedom struggle too were influenced by Marxism to varying extents, from the early revolutionaries of Bhagat Singh’s HSRA and the Communist Party to leftwing Congress leaders like Jawaharlal Nehru, Subhash Chandra Bose and others. This legacy was carried forward in different ways in the post-independence era, through development planning, building public institutions to attain self-reliance and more radical initiatives towards asset redistribution in states where powerful movements of the workers, peasants and deprived sections could create popular, democratic alternatives relatively autonomous to ruling class influence. The diffusion of Marxism in India has been significant, but often in synthesis with progressive indigenous philosophies, which is not surprising given its immense cultural diversity and complex social structure, where class exploitation is enmeshed with oppression and exclusions based on caste, gender, language and religion. The fall of the Berlin Wall and the collapse of the USSR towards the end of the last century, however, had led to a decline in the appeal and impact of Marxist ideas. The advent of finance-driven globalisation from the 1970s also saw a concomitant rise of neoliberalism as the hegemonic ideology across the world. Not only did socialism of the twentieth century become passé, but social-democratic welfare capitalism too was rolled back to make way for the unrestrained movement of finance, goods, services and technologies across the globe. History had come to an end, we were told, with a rapidly flattening world sounding the death knell of Marx’s prognoses. It has not taken long for such bourgeois triumphalism itself to fall flat on its face. The financial crisis originating in the Wall Street precipitated the Great Recession in 2008, from which the global economy has not been able to recover even after a decade. The incipient trade war between the two largest economies of the world today are reviving the memories of the Great Depression. Many of the key actors in India’s freedom struggle too were influenced by Marxism to varying extents, from the early revolutionaries of Bhagat Singh’s HSRA and the Communist Party to leftwing Congress leaders like Jawaharlal Nehru, Subhash Chandra Bose and others. Growing inequality of wealth and income, which preceded the global crisis, have continued to grow more menacingly, with resources getting concentrated in the hands of the billionaire oligarchs and the condition of labouring classes becoming increasingly precarious. With joblessness already at dangerous levels, a new wave of automation driven by robotics and artificial intelligence is already set to makes millions of manufacturing and service sector jobs redundant in the near future. Meanwhile, aggravating pollution of air, water and soil, climate change and other degradations underline the worsening environmental crisis. All these contemporary developments forcefully vindicate Marx’s critique of capitalism – concentration of capital and impoverishment of the workers; economic crisis owing to the anarchic nature of capital accumulation, under consumption and speculative bubbles; labour-saving technological change continuously enhancing the size of the reserve army of labour and primitive accumulation of capital inflicting deadly wounds on society and nature. Moreover, for hugely populated countries like India, China and other developing countries, with a major proportion of the workforce outside the formal capitalist sector, the rate of exploitation remains much higher than the advanced capitalist world, alongside higher levels of underemployment and informality; the rise in inequality is also more stark, annoying and potentially destabilising. Therefore, on the bicentenary of his birth, the ideas of Marx not only remain distinctly relevant but are also likely to gain wider currency, as the gap between the promise of universal prosperity through globalisation and the actual experience of joblessness, insecurity and deteriorating living standards, widens for the younger generation in the workforce. It may transiently be possible for the purveyors of false consciousness to keep a lid on the systemic malfunctioning by conjuring up delusions of grandeur and provoking hatred or conflicts based on race, religion or caste, like the far-right demagogues in power, from the U.S. to India, are doing at the moment. But sooner or later, the truth that human conditions can only be changed for the better, not through divine interventions, but through collective human actions, should begin to prevail. During his lifetime, Marx’s revolutionary energies were mainly directed at analysing and critiquing capitalism, for a fledgling proletarian movement. The “greatest head” could not undertake the recondite project of envisioning a post-capitalist society in realtime and working out a transition path. The socialist experiments of the last century committed a fundamental flaw in disempowering the proletariat, and concentrating all power – political and economic – in the hands of the party-state apparatus. The workers and peasants got gradually marginalised in the soviets, the nomenklatura took over. 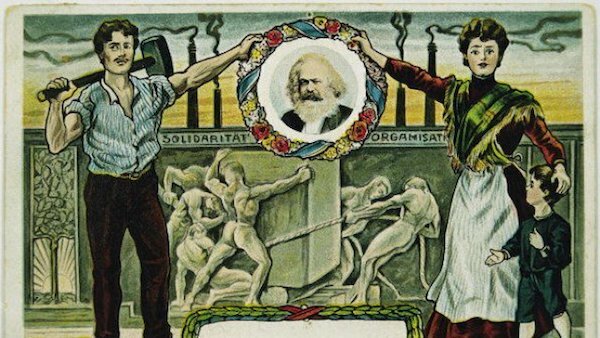 If the current renewal of interest in Karl Marx has to graduate into a reinvigoration of the proletarian movement, Marxism needs to be freed completely from its twentieth century straightjacket, and opened up for critical inquiry, especially with regard to participative and democratic forms of socialist construction. In the Indian context, this would imply a serious engagement with the thoughts of Ambedkar and Gandhi.